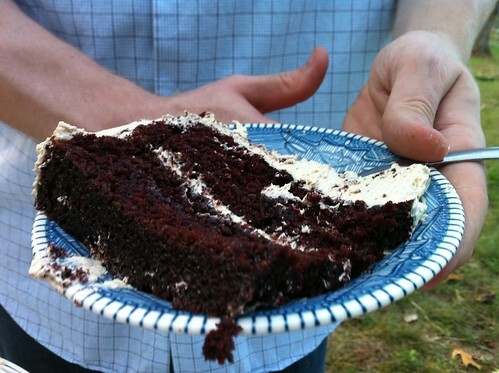 Let’s say you need a cake to bring to a friend’s casual, locally-sourced, DIY farm wedding. It should be delicious. Chocolate has been suggested. And the bride and groom are dear friends you met at the local coffeeshop. You turn to Martha Stewart for inspiration, but you decide that the “Mocha Dacquoise” cake is not quite right, for some reason. Probably because, seriously, what the heck is dacquoise? 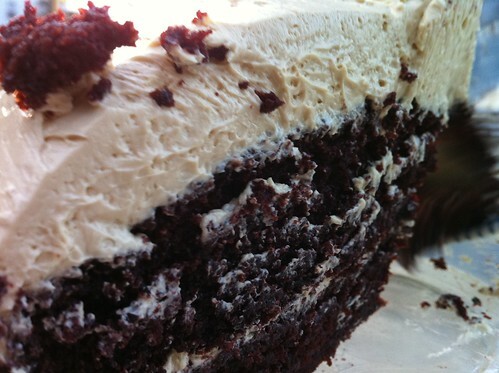 (See: Wikipedia) But coffee buttercream? That sounds pretty amazing. And you remember how good the chocolate cake was in the peanut-butter-frosted, chocolate-ganache-covered cake from last year’s birthiversary extravaganza. My goodness, it was delicious. And you can share it with a lot of people, because it is RICH. Best served with a mug of coffee and/or a tall glass of milk. Enthusiastically recommended for celebrations, coffee-lovers, chocolate-lovers and anyone with a sweet tooth. The Hubbs gives it a BIG thumbs up. But he’s a chocolate lover and a coffee lover. AND he baked it all by himself.